Kundalini Yoga for Youth and Joy by Yogi Bhajan will leave you feeling healthy and energetic, with renewed enthusiasm for life. A body which is strong, flexible and radiant need not be young in years, as a stiff, slow, fragile body need not be advanced in age. An aging body is a body out of tune, out of shape and most often is the result of the inability to handle mental and physical stresses in the environment. Each system of the body - muscular, nervous, glandular, digestive, circulatory - is built up, stimulated and balanced so that you can experience your power and the flow of your energy as a complete human being. 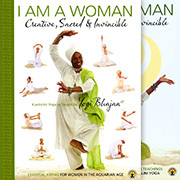 This yoga manual is the result of a six-week Kundalini Yoga course taught by Yogi Bhajan at Khalsa Women's Training Camp in Espanola, New Mexico, in the summer of 1983. Though originally taught to women, these exercises are intended for men as well. Yogi Bhajan was a Master of the ancient science of Kundalini Yoga. This manual gives a practical, step-by-step approach on how to develop a youthful body, an alert mind and a vibrant projection. There is no virtue in letting your body get stiff. When we leave the muscles unused for a long time, they stat deteriorating and create a pressure on the lining muscle cells. That is how we start getting older and weaker. The worst of it all is that our capacity to think and react and act to balance out our intuitive psyche also gets weaker and weaker. The whole of the physical system, the physiology, the muscles and the rhythm of the body have to be understood to keep all parts in balance.